The Vestil SNM-62-AA Narrow Mast Electric Pallet Stacker features powered drive and powered lift operation. Adjustable forks and adjustable support legs allow this powerful stacker to transport standard pallets and open bottom skids. A narrow mast and offset handle give the user a clear forward view for increased safety. This narrow mast pallet stacker can transport and stack pallets and skids to a maximum height of 62". Stacker features a 2,000 LB maximum capacity at a 21" load center and a 53³⁄₈" turning radius. A 1.0KW drive motor propels the stacker at 2.8 mph when fully loaded and a 2.0kw lift motor raises at 1.4 feet per minute when fully loaded. Automatic dead-man feature stops the stacker when the operator releases the handle. 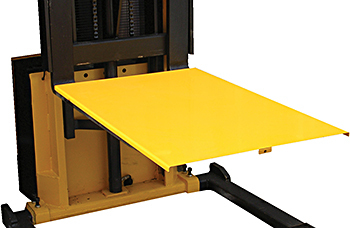 An emergency reverse belly switch when activated causes the pallet stacker to instantly reverse direction until the switch is released or five seconds have elapsed. The SNM-62-AA electric pallet stacker features all steel construction for years of service. Overall fork size: adjusts from 8"W O.D to 26¾"W O.D. Support Leg adjustment width: 46"W to 58"W O.D.